Contributors. Preface. I. Introduction. 1. Barley diversity - an introduction (R. von Bothmer, K. Sato et al.). II. Origin of Barley Diversity. 2. The domestication of cultivated barley (R. von Bothmer, K. Sato et al.). 3. Diversification through breeding (G. Fischbeck). III. Current Barley Diversity. 4. Ecogeographical diversity ¿ a Vavilovian approach (H. Knüpffer, I. Terentyeva et al.). 5. Diversity of barley mutants (U. Lundqvist, J.D. Franckowiak). 6. Cytogenetic diversity (S. Taketa, I. Linde-Laursen, G. Künzel). 7. Molecular diversity of the barley genome (A. Graner, Å. Bjørnstad et al.). 8. Diversity in resistance to biotic stresses (J. Weibull, U. Walther et al.). 9. Diversity in abiotic stress tolerances (A.M. Stanca, I. Romagosa et al.). 10. Genetic diversity for quantitatively inherited agronomic and malting quality traits (P. Hayes, A. Castro et al.). IV. Conservation and Future Utilization of Barley. 11. Detecting diversity - a new holistic, exploratory approach bridging phenotype and genotype (L. Munck). 12. Diversity in ex situ genebank collections of barley (T. van Hintum, F. Menting). 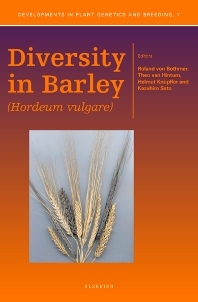 Summarised diversity - the Barley Core Collection (H. Knüpffer, T. van Hintum). 14. Barley diversity, an outlook (K. Sato, R. von Bothmer et al.). Keyword list.